Fully Fortified: Carolina Mountain trout at Fortify in Clayton. I’ve been stopping in Clayton as a kind of way station between Atlanta and points north for many years, since the days when the homey Clayton Cafe meat-and-three was the main downtown dining choice. I’ve always loved the view of the Blue Ridge Mountains from downtown’s little main street, and the wonderful Main Street folk art gallery – and I still like to check in at the Clayton Cafe. But as Clayton has slowly evolved from a sleepy mountain village to a haven for retirees, vacationers and creative types, its downtown restaurants have also evolved, with several sophisticated options embracing the farms and vineyards in its own backyard. The most recent is the most ambitious. In April 2014, Lake Rabun Hotel alums Jack Nolan and Chef Jamie Allred opened Fortify, Clayton’s first serious, homegrown restaurant to highlight local foodways and wines – and to win a spot on Open Table’s “Best 100” restaurants in the country. That contest comes from diners’ ratings on the online reservation system’s website, meaning there must have been an outpouring of support from this tiny town for this small but serene restaurant, its wall featuring a framed black graphic of our state’s familiar shape, with fine, tangled plant roots dangling from the bottom. In fact, the patrons’ affection is almost palpable, even on a bustling weeknight evening, and diners’ effusive praise and thanks are heard often. The restaurant schedules regular “Fortified Farmer Wednesdays” highlighting local suppliers with special dishes. I salivated at an upcoming Easter brunch menu featuring local duck eggs, quail and rabbit. Aside from filling a long unmet need, Fortify has won its place in diners’ hearts with cheerful service and attention to detail. The waitstaff know their clientele well – so often of a certain age (and perhaps vanity) that servers routinely carry a pair of reading glasses for those who have left them at home. The restaurant also offers several gluten-free dishes. I understand their enthusiasm – I was so excited after reading the menu (pork loin chop, lamb shank, local grits, kale and asiago) that in my ordering frenzy I failed to read one description carefully and either left out a salad order or piled on so many dishes that I overwhelmed our waiter. Put the gouda fritters down as my mistake – I would have never ordered deep-fried cheeseballs, as the gouda fritters are clearly described (rather than the cheese-grits fritters I wanted to see), and although they are a popular item, even with the strawberry-pepper mustard jam side, they’re just crisp, oozing fat bombs, more texture than taste and closer to fried mozzarella sticks than I’d like to ever be. But I do wish I’d tried that house salad, with local lettuce, pecans, feta and beets. Still, we were greatly impressed with our meal, starting with the cocktail. The Tequila Tepache, sadly, no longer served, is derived from the mild, fermented traditional Mexican drink. With lime and a sprig of cilantro, just a verdant hint of this potentially potent herb, the cocktail is refreshing and lightly sweet. The herbaceous quality makes it closer to a mojito than a margarita. The wine list includes some familiar names like La Crema chardonnay with lesser known Chilean, Argentinian and Australian labels, as well as reds from local Tiger Mountain Vineyards and Stonewall Creek. Another fried starter, the oysters, worked well. They have the kind of light, fine cornmeal crust I love best; the bread-and-butter pickle tartar sauce and celery root slaw were quickly wiped clean, too. While our six-ounce filet with buttermilk mashed potatoes, Tiger Mountain Rabun Red-blue cheese sauce and smoked-bacon/onion marmalade was a perfectly good carnivore-pleaser, properly cooked to medium-rare, the cornmeal-crusted Carolina mountain trout really shows what the place is about. 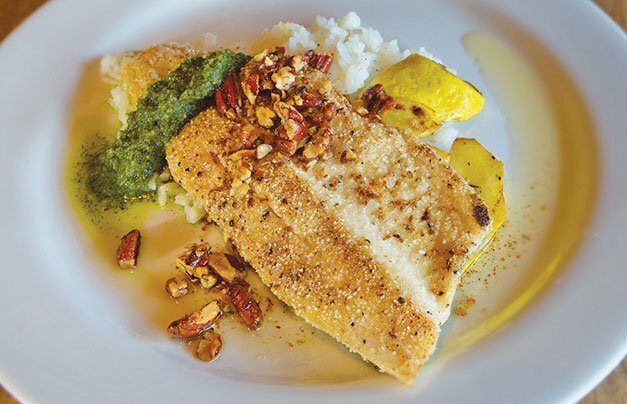 Lightly dusted rainbow trout, with lemon Charleston Gold rice, pecan brown butter and dill pesto, the dish has a sense of fun – the flavors and textures lightly playing against each other rather than sharply contrasting. The sides were also outstanding – pan-fried corn and okra and roasted Brussels sprouts. I loved the duck confit-pommery mustard butter (terrific with the house-made cheese bread) so much I took the leftover dollop home. Flourless bourbon chocolate cake with a scoop of house-made pecan ice cream cemented our vow to return. In fact, now that we’ve seen how much Clayton has to offer, we’re thinking of staying overnight. If you haven’t been in a while, you may be surprised to find on Main Street an offshoot of Atlanta’s Oakhurst burgers-and-brews outpost Universal Joint, with an outdoor bandstand (www.ujclayton.com); the White Birch Inn’s Laurel Bar, offering small plates and cocktails (www.whitebirchinn.net); and Rumor Hazit, an island-themed, renovated old house featuring a rambling patio with a nice mountain view and a grouper Reuben (www.rumorhazit.us).